Vina Echeverria is a family owned and run estate winery in Molina, located in the Curico Valley, Chile’s oldest wine region, located some 200km south of Santiago. Here diversity is king, thanks to the cooling influence of the oceanic breezes through the valleys of the coastal mountains, allowing for both red and whites grapes to achieve outstanding fruit aromas and exceptional color concentration. Here are grown over 30 variety of grapes – more than any other wine region in Chile. The region’s fertile soils are derived from limestone and volcanic rock from the Andes and have been deposited in the valley over time by the rivers (alluvial) as well as by gravity (colluvial). The 65 hectare Viña Echeverría estate, which is sustainably farmed, is planted with Sauvignon Blanc, Chardonnay, Viognier, Cabernet Sauvignon, Carmenère, Merlot, Pinot Noir and Cabernet Franc. Working with a model of micro viticulture, each plot, no more than half a hectare, is identified according to its terroir and microclimate, and planted accordingly. Grapes are subject to specific pruning, irrigation, canopy management and harvesting, which result in grapes of optimum quality and flavor. This ‘precision viticulture’ is highly labor-intensive and nature-conscious to produce grapes which are organically grown. At Viña Echeverría, our winemaking mission has always been to use our long history of family expertise to craft elegant best-in-class wines which are expressive of our beloved landscape. Our sustainable estate winery is the setting for our traditional and respectful viticulture approach, where mother nature along with precision viticulture allow our organically grown grapes to reach their maximum potential. 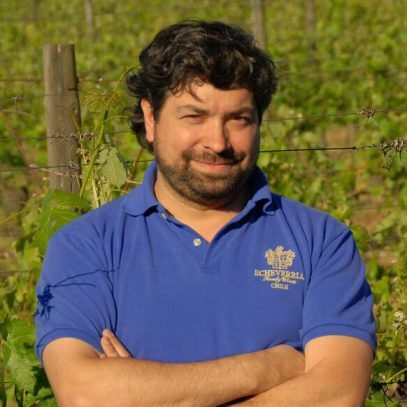 Roberto Echeverría Jr has been the Chief Winemaker of Viña Echeverría since 2001, and is supported by a young team of winemakers from both Chile and Europe. In this way, he is able to ensure the consistency in quality year after year that all our customers depend upon, but also bring added innovation and passion to the winemaking team. Inspired by his French family heritage, Roberto´s signature style produces wines that blend New World innovation with Old World elegance. More European viticultural techniques include timely harvesting to avoid over ripeness and therefore good balance and control of alcohol levels. Focus is on French varietals, barrels and yeasts, as well as longer fermentation and aging in barrels and diverse blending. We are also proud to craft some of Chile’s most complex artisanal wines, such as our Botrytis Sauvignon Blanc and Traditional Method Sparkling wine, both of which have won some of the industry’s best accolades. As a Chilean, and a winemaker, it is hard for me sometimes to think as my country as a Cool Climate wine region. Chile is home to the driest place on the planet, the Atacama Desert, and much of Chile enjoys a warm and dry Mediterranean climate. In fact, you just have to look on a map to see that Chile’s astonishing geography holds the key to why not only is it known as the Winemaker’s Paradise, but also why it is able to offer up such rich diversity, boasting within its borders at least seven major climatic subtypes! Stretching nearly 5000 km along the southwestern coast of South America, Chile’s entire length is flanked by the Pacific Ocean, with the considerable cooling influence of the Humboldt Current. These important factors account for why many of Chile’s coastal vineyards, and indeed much of its inland ones as well, are considered cool climate. In the centre of the country is a long and expansive river valley, a 800 km corridor occupied in the north by vineyards, and in the south by great farms, forests and lakes. It is this valley and the coastal mountains that border it to the left that allow for Mediterranean wine regions to sit relatively close to cool climate ones. It was over these coastal mountains in a wine region not 50km from our own vineyards that we first discovered the region of Ucuquer (pronounced ‘Ookooker’), in the Colchagua Valley, whilst driving for a day out to the coast. Its vineyards sloping and peaking down to the sea, accompanied by maritime breezes made us wonder about how different a Chardonnay made from here would taste. In 2015 we made both a Chardonnay and a Pinot Noir from grapes grown in this region and we were impressed by how different a wine could taste while its grapes were exposed to such alternative climatic conditions. In particular, the maritime influence contributing to nighttime coolness, preserving the elegant aromas, as well as the freshness and minerality of the wine. The coastal character of Ucuquer can still be found in the Curico Valley, where our vineyards and winery are located. This is Chile's most diverse wine region, with warm summer days and very cold nights. Cool breezes enter through rivers valleys at the west, and from the east the influence of the Andes' eternal snow peaks make it a perfect environment to produce fresh and vibrant 'Chablis style' Chardonnays, with outstanding minerality and natural acidity. Since then we have travelled further south in our search for cool climate wine regions, reaching almost to Chile’s impressive lake district some 600km south of Santiago. Here in the increasingly highly valued valleys of Bio Bio and Malleco, the climate is cool, with a high level of rainfall, a short growing season and good diurnal temperature variation. Despite good rainfall, the soil, composed mainly of sand and clay, is well drained, so vines here are required to make extra effort to hydrate, resulting in less foliage and lower grape yields. These factors produce grapes with more concentrated flavours and excellent structure. My family braved a new frontier when it started making wine in Chile nearly 100 years ago. Now wine takes us on a new journey of discovery which has shown us not only some breathtaking geography, fascinating local communities and rewarding teamwork, but also brings us nearly 9000km away to Canada, and to you (the reason we make wine). Enjoy!